Just received an email and a great offer from Expedia. It is the perfect timing for me since I need to book some hotels. I just hope it doesn’t turn out like their previous coupon. Until 1st of April they are offering $50 from a minimum booking of $200. The coupon is valid from today and for travel until 31st of May. And it seems to be working on a dummy booking I did. If you have any planned trips this is a great way to save some cash. Offer: Receive an instant $50 coupon discount off your hotel stay. 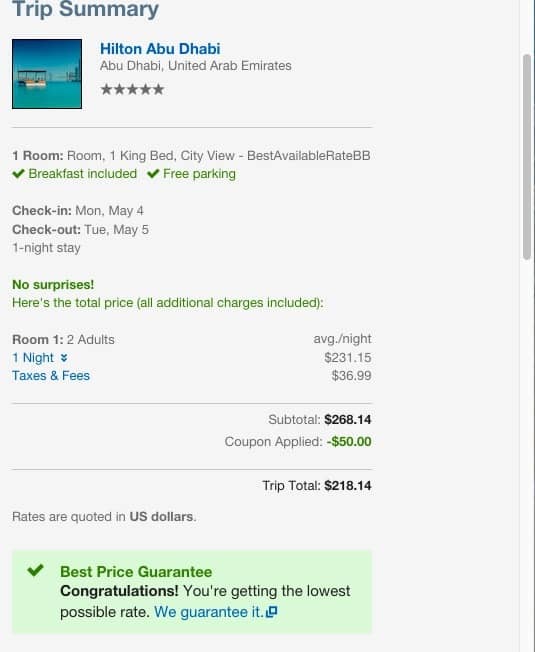 The price of the qualifying hotel booking must be at least $200. How to redeem: Sign into your Expedia.com user account, and select a qualifying hotel stay. On the hotel billing and delivery page you will see a drop-down feature that states “Enter a coupon or promotion code”. Touch the drop-down feature and enter the code that was sent to you via e-mail. 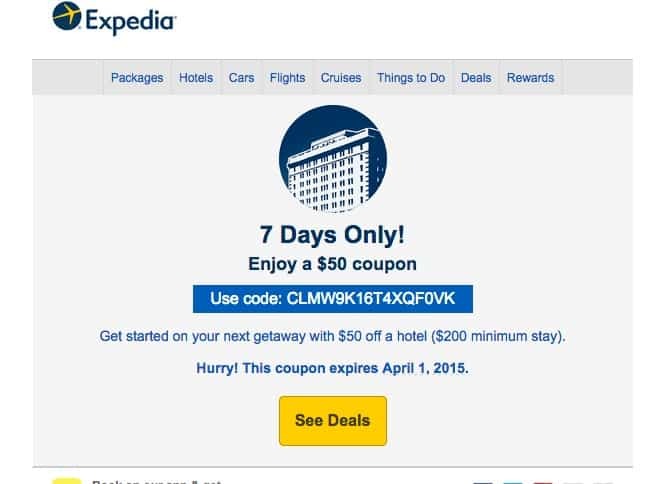 Restrictions: Coupon must be redeemed on Expedia.com by 11:59 PM (Pacific Time) on April 1, 2015, for travel between March 26, 2015 and May 31, 2015. Limited time offer: subject to change. Limit one (1) coupon per user account and per qualifying hotel booking when you pay online at the time of booking. This offer is from Expedia.com and is valid for Expedia.com U.S. customers only. Bookings are subject to availability at Expedia Rate hotels at the time of booking and all applicable terms and conditions. Coupon may not be used with other coupons, promotions or special offers. Coupon discount cannot be applied against taxes, supplier-charged fees, cancellation or change penalties, administrative fees or other miscellaneous charges, which are the sole responsibility of the customer. A coupon is considered fully redeemed once a qualifying booking has been made; payment is made online at the time of booking and may not be reused. In the event that you change or cancel any part of your booking, the coupon will not apply to the changed travel schedule. Terms and conditions of this coupon are as written and cannot be changed by any representation of any unauthorized person, including employees of Expedia, Inc. Customers affiliated with Expedia’s Travel Agent Affiliate Program are not eligible for offer. Coupon is not transferable and is not redeemable for cash. Expedia, Inc. may revoke or change this offer at any time. Void where prohibited by law. Appreciate you sharing this e-mail, but why even write a post about a one-time use coupon? Coupon worked first time I tried to use it for dummy booking, but now it doesn’t. I received a similar offer, but required a MasterCard. I have an upcoming trip, but I need to hit my spend requirement on my new CSP (visa)! Too bad.